What a weekend I had! In case you've been on an Internet fast for the past few weeks, then here's a quick recap: this past weekend was The Makeup Show Orlando, aka the greatest thing to happen to beauty lovers everywhere. But I'm not going to get into the recap quite yet- that post will be coming up tomorrow. I did want to share with you all my haul from the show, just so you guys can tell me if you want to see any of these products reviewed in an upcoming post. 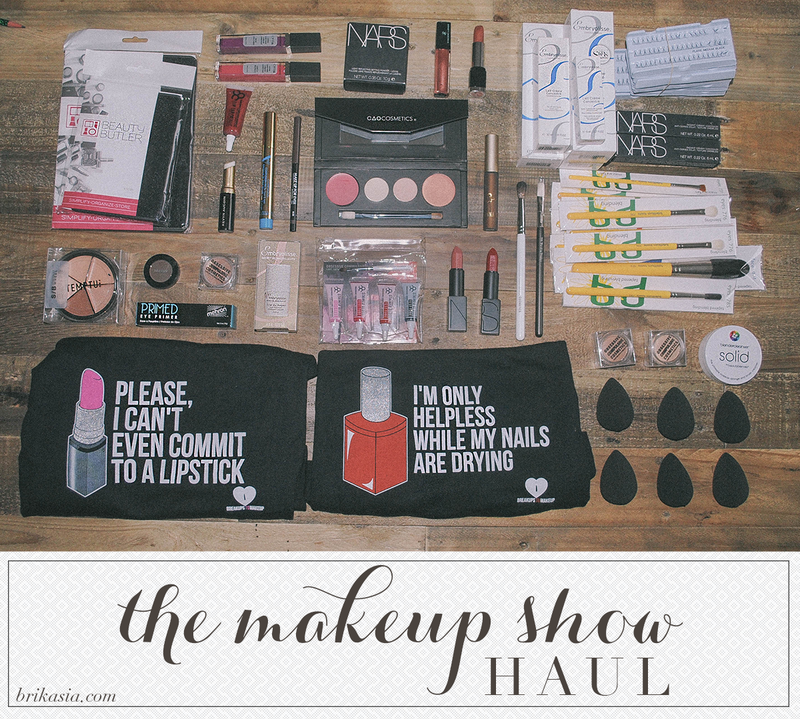 I very rarely post haul blogs since it's sooo braggy, but I'm throwing caution to the wind and just going for it. I know, how brave of me. Sad thing is- I didn't even include everything I bought in this photo. I need help. OY! What a list. Let me know if there's anything you'd like to see reviewed or used in the future! Did you go to The Makeup Show Orlando? Did you haul anything? Disclosure: Products marked with an asterisk (*) were provided in the Blogger Preview goodie bag or provided by the brands. Everything else purchased by me. Post also contains affiliate links. Will do, Mary! Thanks for leaving a comment! Good gravy that's some amazing stuff. LOVE those bags. Would love to hear about the brushes! And what an amazing, droolworthy haul <3. Consider it done, Deborah! Thanks! OMG, what a haul! Love to hear about the brushes! I'm also interested in learning about the Temptu concealer wheel -- is it just a pro product? You know what, I'm not sure, Allison! I'll have to look into that. I think you can buy it on their website, though. I'll be sure to review it, though! WHOA!!!!!!!! This is a truly amazing haul, Brianna! I would be happy with every single choice that you made! AWESOME! I hope that you love everything that you got! Amazing haul! I love the Bdellium tools brushes and the Pro version of the Beautyblender. Those tank tops are so cute. I first thought they were bags lol. LOL I think because I folded them up, people have been thinking they're makeup bags! Now that's a haul! I'm loving those makeup bags - so adorable! Wish we have makeup shows here in HI. I will hoard for sure, haha!